Happy Holidays! Today's nails are inspired by holiday music. I like the story that this scene tells. 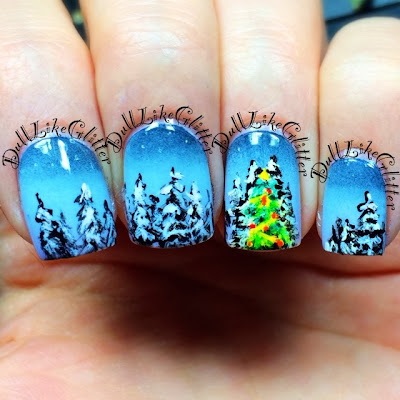 Who wouldn't want to happen upon a decorated tree in the middle of a snowy forest at twilight? For this look I created a three color gradient using Essence I'm the Boss, Zoya Blu and Revlon Charming. The trees are hand painted! I'd like to complete a few other nail art designs before Christmas. Any suggestions? You have hand-painted this!? Oh holy moly. Looks amazing!